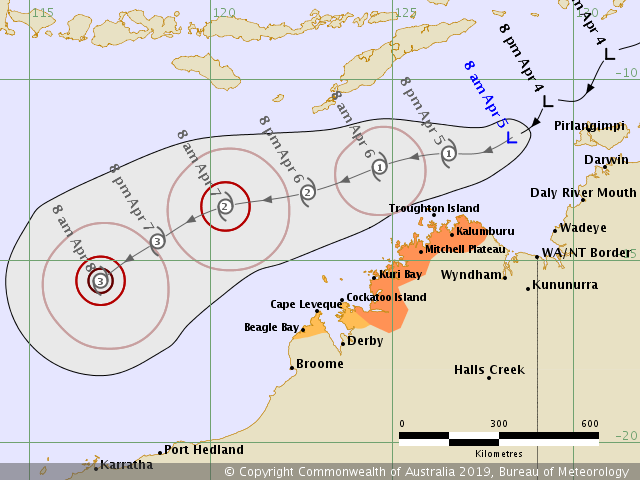 A tropical cyclone may develop north of the Kimberley coast later today or on Saturday. A period of gales possible along the North Kimberley coast. Cockatoo Island to Beagle Bay, not including Derby. Location: within 55 kilometres of 11.6 degrees South 128.3 degrees East, estimated to be 230 kilometres west of Pirlangimpi and 350 kilometres north northeast of Kalumburu. Movement: southwest at 13 kilometres per hour. A developing tropical low may develop into a tropical cyclone later on Friday or Saturday north of the Kimberley coast. The system is expected to track towards the west southwest and is likely to develop further over the weekend. Early next week there remains potential for the system to approach the west Pilbara coast. GALES are not expected in coastal parts this morning or afternoon. GALES with gusts to 100 kilometres per hour may develop in exposed coastal parts between Kalumburu and Cockatoo Island from late Friday or early Saturday if the system tracks further south than expected. GALES may extend to exposed coastal parts from Cockatoo Island to northern parts of the Dampier Peninsula from Saturday afternoon. BLUE ALERT: People in or near Kalumburu to Cockatoo Island need to prepare for cyclonic weather and organise an emergency kit including first aid kit, torch, portable radio, spare batteries, food and water.